Christmas day means many things: time with family and friends, presents under the tree, the Queen’s Speech and lots of food. 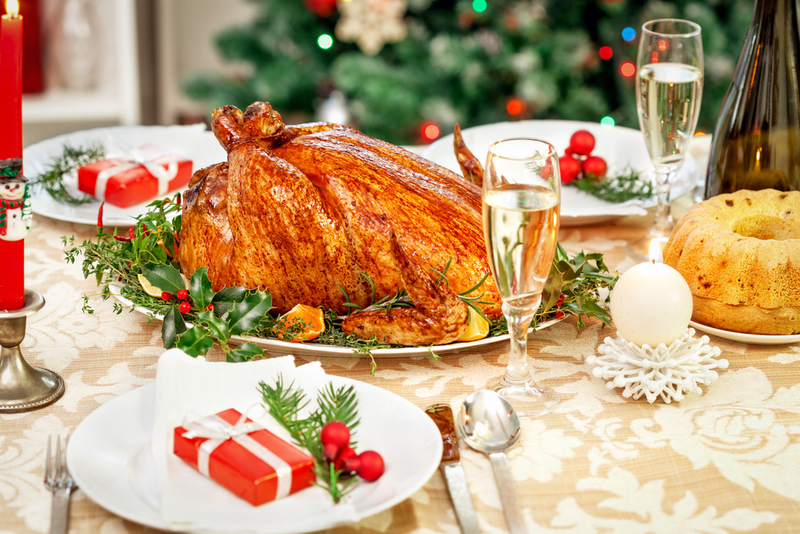 In the last case, there is no doubt that creating a superb Christmas dinner is a wonderful way of ensuring the day is a good one. For that reason, it’s a good idea to get some top tips on ensuring the turkey (or even the goose) is done just right. It should come out nice and moist, with lots of flavour and accompanied by crisp roast potatoes. Exactly how long you cook the turkey for depends on its size. For example, three hours and 20 minutes at gas mark four is ideal for a 13 lb bird, whereas two hours and 45 minutes is best for an 11 lb turkey. However big the bird is, you should give it a 15-minute spell of sizzling at gas mark six before the long cooking period. This will caramelise the fats and add loads of flavour. You might have heard that this will seal in the bird and stop the moisture escaping, but this is not true. Basting is the other essential task. Every half an hour you should use a spoon or turkey baster to cover the top with buttery juices. This stops the skin and the top flesh from drying out. This should be done quickly to avoid affecting the cooking time. When you take the turkey out of the oven, check the thigh juices are running clear, as this will show it is cooked. Slip a knife into the thick meat between the thigh and breast. Only if it is pinkish should you pop the bird back in the oven for another 15-20 minutes.Once the turkey is out of the oven, allow 30 minutes for the bird to rest and the juices to redistribute themselves, during which time you can make the gravy. At this point, you can also brown off the roast potatoes. The trick is to give them a light coating of butter and then a few extra minutes to create a golden, crisp top. Once that is done, you can serve up your delicious, juicy turkey with all the veg, stuffing, cranberry and bread sauce. Just don’t forget the crackers!